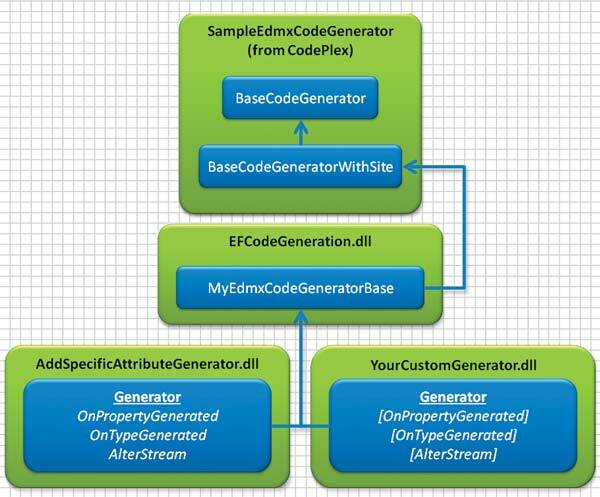 Customize Code Generation in EF: Figure 1: Separate Responsibilities. Separating responsibility among three assemblies supplies a flexible framework you can evolve to meet your Entity Framework code generation needs. The relatively complex interaction with Visual Studio is tucked away in the base assembly, which can be borrowed from an ADO.NET team example. Your customization relies on this and the basic generation supplied by the middle assembly.